Happy New Year to all our followers and friends! 2013 was (again) a busy year for ME4Writers. ME4Writers was started in 2009 by Sam Fentiman-Hall and since then, the collective has worked with over 500 members of the Kent community (focussing on Medway), on over 40 literary projects and events, with the aim of bringing more words to Medway. Some examples of the sort of events we have run are: poetry open mics in alternative venues; new writing shows at the Dickens Festiva;, an open exhibition about memory and place – ‘Letters Home’ – in two Medway libraries; a Medway-wide poetry treasure hunt game for National Poetry Day; creative writing workshops and tutorials; took ‘possibly the world’s smallest writing retreat’ to the Fuse Festival 2013; published an anthology of creative writing about cities; and created a walking-writing tour of Rochester and other events for the inaugural Rochester Literature Festival. 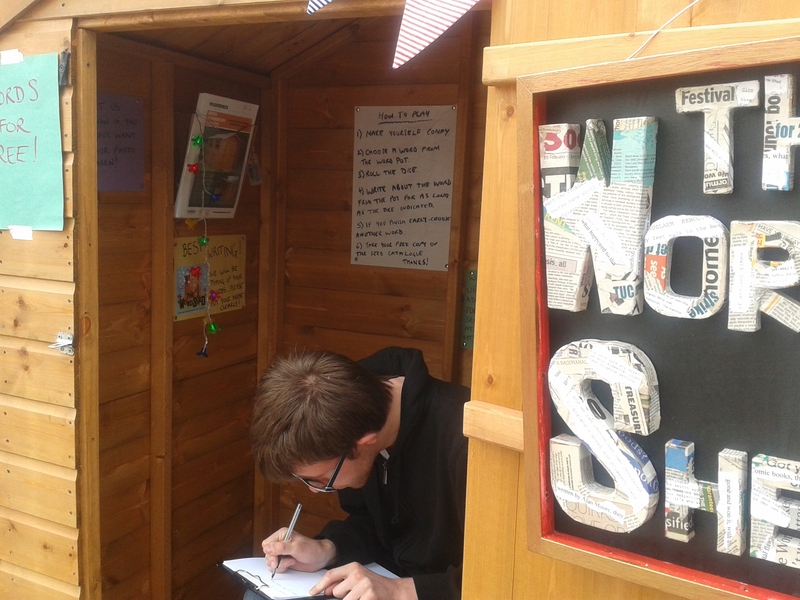 May-June: The WordShed at Fuse Festival – we received a Spark Commission from Medway Council to pilot our new writing shed. We lead four creative writing workshops in Strood, Rochester, Walderslade Village and Chatham libraries in advance of the festival. 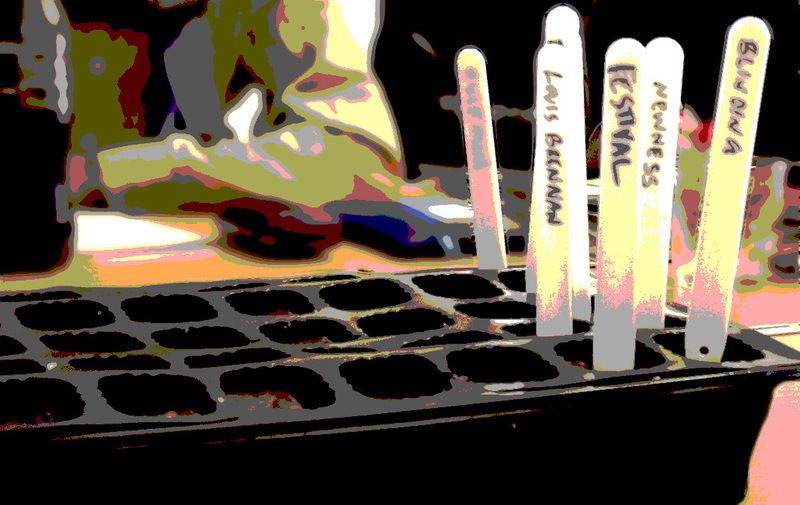 We also made a printed booklet The Seed Catalogue with highlights from the workshops, which was given out at the festival, and online we published The Seed Compendium, a collection of everything (legible) from the Fuse Festival weekend. Find out more about the WordShed on the WordShed blog. July and October: Rochester LitFest – we created a number of literary delights for the new festival. In July at the Garden Party we did a version of WordShed lite in the garden at The Good Intent. Then in October, at the festival proper, we played Poetrymon – our poetry treasure hunt game (in the pouring rain) on National Poetry Day, launched our first full-length book (published by Wordsmithery) City without a head, and led a walking/writing tour of Rochester. For 17Percent, Sam also produced a theatre show; She Writes – What’s through the door? City without a head: This is the culmination of a long standing ME4Writers’ project. Extracts from the anthology were published in parts as part of a guerilla distribution scheme, where we hid issues of a limited edition fanzine around Medway and further afield (some went to Sweden, Australia and America!) 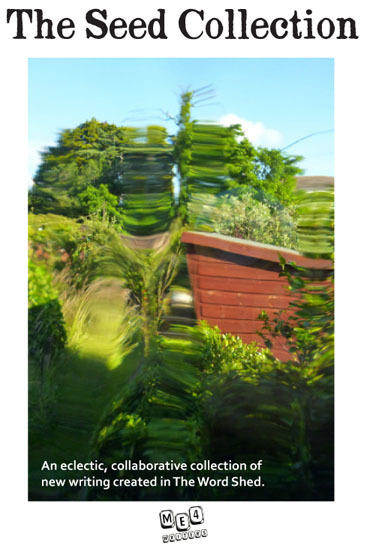 Wordsmithery launched City without a head on 8 October 2013, you can still buy a limited edition issue from Wordsmithery. In November we read extracts from the book on Fizzer’s Radio Show, which you can hear here. We are delighted to say we will be taking over the shed in the garden of the Good Intent, as a temporary squatted home for the Word Shed during the afternoon of the Rochester Literature Festival Summer Garden Party! Come along and sit in our lean-to between 12noon and 4pm on Sunday 14th July 2013, at the Good Intent Pub in John Street, Rochester, where you can do some writing themed around summer. The party will feature a delightful cultural mix of performances, open mic, storytelling and a special edition of Seasonally Effected. There might even be an opportunity for you to sit on Charlie’s Chair and get inspired by a local literary ghost! See more on the Rochester Literature festival website. The Word Shed at Fuse over… watch this space for what’s next! We had a fantastic response to our project The Word Shed at the Fuse Festival. We had almost 100 people from ages 3 (with some help from mum!) to 90, who took some time out from the festival (and the sometimes rainy/windy weather), to sit in the warmth and shelter of the shed to do a bit of writing. A lot of those who visited had never had a go at creative writing before, or hadn’t really done any since school, and told us they really enjoyed the opportunity to share their stories. For those little ones who weren’t quite up to writing in the shed, we also had large pieces of paper on the pavement in Gillingham and Chatham, where they could express themselves in words or pictures, and we had about 30 children writing and drawing on the pavement paper during the two days, with one visitor telling us she had come specially from Gillingham to Chatham the next day, as her children had enjoyed being at the shed so much! 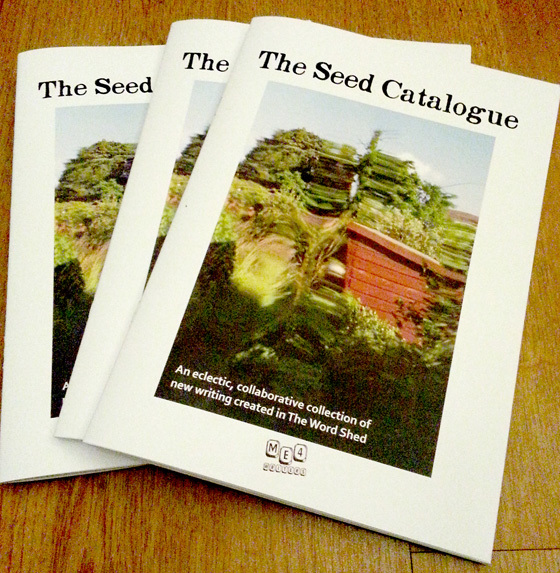 On the last day of Fuse, we launched our Seed Catalogue booklet. This is a creative writing pamphlet containing a selection of writing done during our creative writing workshops (WordShops) in the run up to the festival. We handed out a copy to anyone who came to the shed who wanted one, and also did some readings from this new publication. A few remaining copies will shortly be available from the libraries where we did our WordShops. You can also download it from The Word Shed blog. Once again, thanks to Fuse festival (The Word Shed was developed with the aid of a Spark Commission), and to Passmores who loaned us the shed for the weekend. Two weeks to Fuse Festival! It’s only two weeks to the Word Shed at Fuse Festival, and furious typing up of contributions has been happening all this week. Here is a sneaky peak at the cover design for ‘The Seed Collection’ – a collection of writing seeded at the WordShops. This collection will feature a selection of writing from attendees at our creative writing workshops and will be given away free from the Word Shed, during the festival. Most of the other contributions (less the ones we couldn’t read, best handwriting please!) – including those from the last workshop, and visitors to the shed, will be added to a chunky, comprehensive PDF for download from the Word Shed site, and we will read pieces from both these publications on the final day of Fuse. We have been holding some fun creative writing workshops around Medway in libraries. 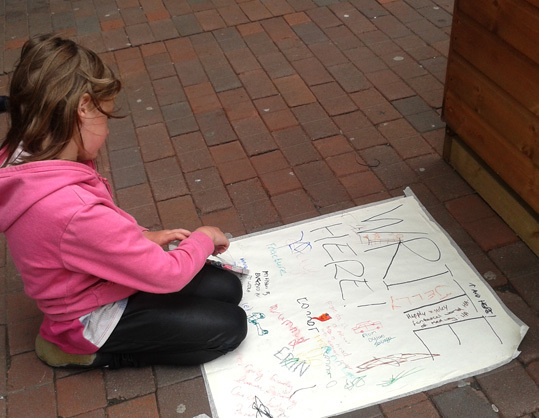 Last weekend we went to Walderslade Village, where we did a variety of writing exercises. The aim of the workshops is to make a collaborative publication which we will launch at the Fuse Festival in our Word Shed (possibly the world’s smallest writing retreat!) Next weekend we are taking a break as it’s the Dickens Festival, but we are back with out last ‘WordShop’ on 8 June at Chatham Library from 1.30-3.30pm. Please book with the library on 01634 337799. 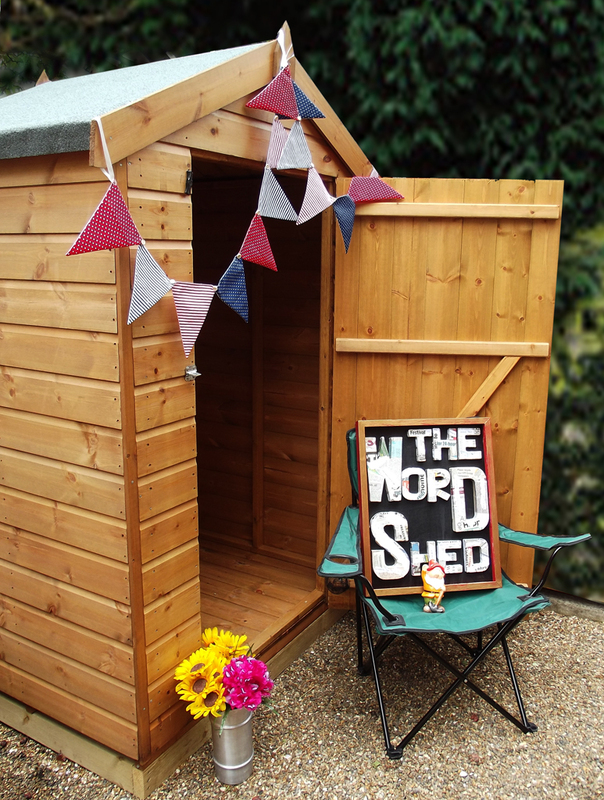 Find out more about the Word Shed project. hate, love, peace, joy, despair, the sounds we hear can ignite such a sensation. change the tune when feeling down, see if a smile can kill your frown. ….. Thanks to all who attended, and the staff at the library for hosting us! And you can follow our Shed’s progress on Twitter or Facebook.